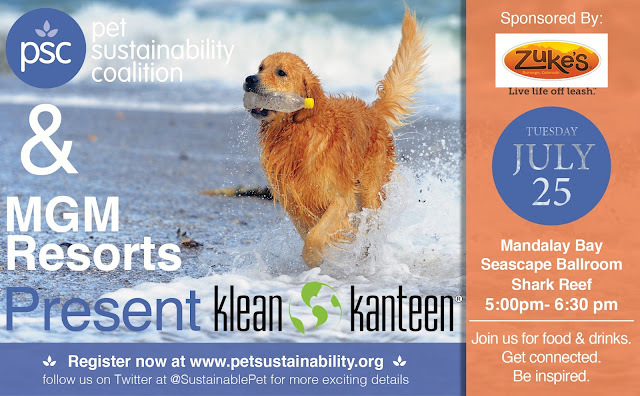 On July 25th, the Pet Sustainability Coalition (PSC) and co-host MGM Resorts will invite 100 industry guests to the Shark Reef Exhibit where they will learn from CEO Jim Osgood of Klean Kanteen about how driving environmental and social impact lead to greater profitability. With a special focus on ocean health, the event will highlight the opportunity that the pet industry has to reduce ocean trash, one of the top five issues affecting our global waters. This event is part of a semi-annual event series that takes place every year at Global Pet Expo and SuperZoo and follows up PSC’s Impact Unleashed event where 65 of the industries most innovative leaders gathered to get the inspiration, tools, and resources to accelerate business success through environmental and social impact. Tickets are limited for PSC’s SuperZoo event but you can still find tickets through PSC’s website at www.petsustainability.org/trade-show-events. PSC was founded in 2013 with the mission to accelerate environmental and social sustainability in the pet industry through education, implementation tools and collaboration. It has partnered with Natural Capitalism Solutions, the Outdoor Industry Association’s Sustainability Working Group, LoveAnimals.org, B-Corporation, Sustainable Apparel Coalition, GreenBlue and others to provide member companies with the resources and guidance they need to attain continual sustainable improvement. To join in PSC’s progress and learn about their Impact Unleashed event, please visit their website, and follow them on Twitter, LinkedIn and Facebook.